Egypt's Chief of Staff Mohamed Farid met on Wednesday with his Saudi counterpart Fayyad bin Hamed al Ruwayli and his accompanying delegation. The two sides chaired meetings during the closed session of the Egyptian-Saudi military cooperation committee. 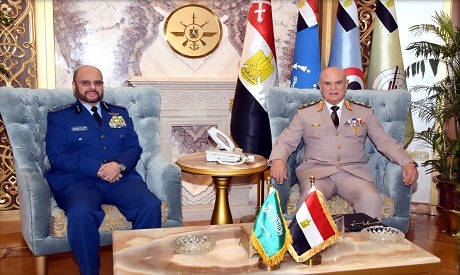 The group discussed issues of mutual concern, including the latest developments in the region and ways of promoting cooperation between the Egyptian and Saudi armies. Farid and Ruwayli both hailed the level of cooperation and consultation between the two countries in the military and security fields.